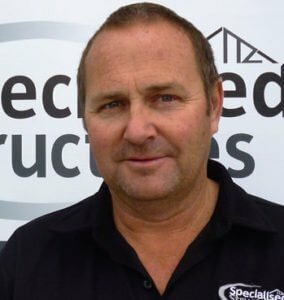 Chris bought into the Specialised Structures system for the ability to offer his clients superior buildings at affordable prices. He especially likes the fact that the Specialised Structures system uses quality materials from local suppliers to create robust and durable buildings of any size. Initially a qualified plumber and drain layer, Chris has now been in construction for 20 years plus. He’s a highly experienced project manager, noting that his key strengths are the ability to listen and deliver on what his clients want. And, because he’s worked in this area always, Chris has gained an excellent understanding of the challenges involved with construction in the local environment. Chris also owns Smada Projects Ltd, undertaking the construction of new homes and excavation work. In his spare time, Chris is mad about motor racing, fishing and hunting. He’s a Motorsport NZ steward and driving standards observer. Providing customised steel building solutions within the Otago region; Dunedin, Mosgiel, Milton, Balclutha, Middlemarch, Outram, Waikouaiti and the wider area.